Solar inverters form a major and an essential component of the rooftop solar system. The solar inverters have today evolved from being more than mere boxes, to become more smart and intelligent. The main function of an inverter is to convert direct current into alternating current that help in running the appliances in our homes. Generally string inverters are more commonly used for rooftop solar, since any default in one string of solar arrays will not effect the entire functioning of the system. The fault can be solved at the string level itself. When using central inverter, the AC is converted into DC at a central level, common to the entire system. Residential rooftops generally cannot support central inverters. Microinverters are the best option for residential solar and is also prevalent in the western parts of the globe. They are more intelligent and smart, but are costlier. Solaredge and Enphase Solar are the largest players in this segment. However they are not commonly seen in India. 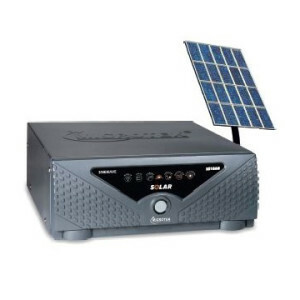 Compare and buy best selling Solar Inverters in India here. 1) Delta Energy Systems – Founded in 1971, this Taiwanese giant electronics firm has sales offices worldwide and inverter manufacturing facilities in Taiwan, China, USA, Europe, Thailand, Japan, India, Mexico, and Brazil. The company’s products Solivia string inverters and Solivia central inverters are best suited to match the Indian rooftops and utility scale projects in India. The string inverters come in a wide range from 2.5 kW to 600 kW. They also provide a monitoring system to check the system’s performance. 2) SMA Solar – SMA is known as the best brand of solar inverter in the industry for its high quality and reliability. It is the world’s biggest supplier and manufacturer of solar inverters. SMA sells a wide variety of solar inverters for different markets of medium power solutions, solar power plants as well as residential solutions. Sunny Boy inverters are targeted mainly towards the residential market and come in a wide variety of sizes starting from 460 W and ending at 10000 W.
3) SuKam – India imports most of its inverters, however SuKam remains the largest domestic manufacture of solar inverters in India. It manufactures PV grid connected inverters and solar Sine wave inverters. Su-Kam’s Brainy Eco Inverter is a hybrid solar inverter that is perfect for every home, as it can charge both through grid and solar. The Brainy Eco inverter system works efficiently and smartly to manage the laod in a house. Although Brainy Eco is a hybrid solar inverter, it gives you the option of disabling grid charging completely, which leads to huge saving on the electricity bills. It also has an in-built 30 amp solar charge controller. 4) Kaco New Energy – is a German company manufacturing a wide range of solar inverters. Some of its solar inverters used for residential purposes in India are Powador (1.65-5 kV & 2.6-5.5 kV), blueplanet (3-5kV & 5-10kV) and ultraverter. 5) Luminous – The company sells both grid-tied inverters as well as inverters for off grid solar applications. Luminous is a New Delhi-based maker of inverters and industrial batteries with Schneider having a 74% stake in it. Its solar home UPS consists of Pure sine wave inverter with 85% efficiency and logic control and this hybrid UPS is available in the range of 500VA, 850VA & 1500VA. Buy Luminous inverter in India. Important Note: you can convert normal conventional inverters into solar inverters too. 6) Microtek – is another manufacturer of inverters in India. Its UPS Solar SS 1600VA has an in-built 30 Amp Solar Charge Controller. It is hybrid in nature, running both on solar power and mains. Buy Microtek inverter in India. 7) ABB – is another large scale producer of solar inverters in the industry, manufacturing micro, three-phase string and central inverters. Thus it serves all residential, commercial and industrial segments. The string inverters are most suited for residential purposes and ABB offers both single phase (2-6 kW) and three phase (5-33 kW) solar inverters in this regard. Bonfiglioli – Is a European firm having manufacturing bases in USA, Italy, Germany, China, India etc. The company has a strong presence in the industrial and commercial solar installations in India. The company sees a great future potential for on-grid and off-grid battery storage systems in the Indian market. Advanced Energy – or AE Solar Energy as it is commonly known as, was founded in 1981 and has a diversified global footprint. The company used to manufacture solar inverters for all segments – utility, commercial and residential. 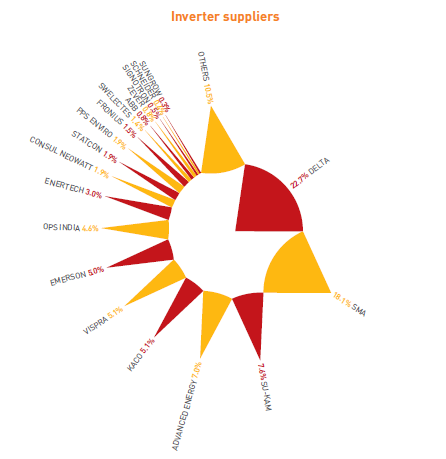 However it discontinued inverter manufacturing in June 2015 and is now involved in solar O&M services. The solar inverter market is seeing increasing competition, as its large growing size attracts numerous companies. Solar inverters have become highly sophisticated with features like optimization and monitoring etc. The efficiency of solar inverters are a major factor in their purchase as well as the quality and reliability. Hence prudence must be exercised when purchasing one for your rooftop solar system. THESE ARE GOOD BRAND OF SOLAR INVERTERS OF COURSE. LETS TALK ABOUT SMA. YOU CAN GO FOR IT BUT THE SERVICE OF O& M IS VERY POOR ALSO THEIR INVERTER GO ON REPETITIVE FAILURE. AND THE RESPONSE OF INDIAN TEAM IS VERY BAD.WELL I SUGGEST DONT OVERFLOW ON PEOPLES SUGGESTION ON BRAND. DO A MARKET SURVEY WHO PROVIDES BETTER MAINTENANCE AND OTHER SERVICES ALSO.